In the Highlands of Scotland, the Cairngorms, which have four of the five highest Scottish mountains, are unique. The combination of vast high-level plateaux and deep corries, clothed on their lower flanks by the ancient forests of Mar, Rothiemurchus and Nethy, gives these mountains a grandeur of their own. The landscape, climate and ecology of the high storm-swept plateaux are similar to the Arctic, and throughout these mountains the effects of glaciation and other forces of nature are very evident. It is no wonder that the Cairngorms make a profound impression on all who go to climb or walk on them. 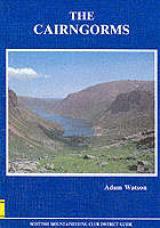 In this authoritative guidebook, the Cairngorms are described with the expert knowledge and deep insight that are to be expected from an author of Adam Watson's standing.